The Royal College of Organists has awarded the newly founded Medal of the Royal College of Organists to three distinguished musicians in recognition of their outstanding contributions to organ playing, organ and choral composition, and conducting. 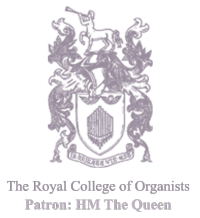 The Medal of the Royal College of Organists (‘The RCO Medal’) is a new honorary award presented in recognition of either distinguished service to the College or for distinguished achievement by an individual across one or more organ- and choral-related disciplines such as performance, teaching, scholarship, composition, organ-building, conducting, administration and philanthropy. •	Sir David Willcocks CBE, MC (for organ playing, choral composition and arrangement, and choral conducting). Making the presentations, RCO President James O’Donnell said: “This is the College's highest honorary award. It is reserved to those who have shown outstanding achievement in their fields. The ceremony also saw 49 Members of the College conferred with Fellowship of the College (FRCO), Associateship of the College (ARCO), Certificate of the College (CertRCO) and the Diploma in Choral Directing (DipCHD). The ceremony closed with the Ede & Ravenscroft Recital, in which Daniel Cook (Organist and Master of the Choristers, St Davids Cathedral), played music by Mendelssohn, Bach, Parry and RCO Medal honorands Dr James MacMillan and Dr Francis Jackson. The vote of thanks was given, according to custom, by Freddie James FRCO, winner of the Limpus Prize in Summer 2011. Hugh Fullarton (Box Hill North, Victoria, Australia) collected his FRCO diploma, which was awarded in the Winter 2011 examination session.